VANCOUVER, BRITISH COLUMBIA — On October 20, 1992, I stood in line for nine hours to see a baseball game. That was the night of the first World Series contest played in Canada. The Hard Rock Café, which back then was nestled into a corner of the stadium, charged only $15 and a two-drink minimum — the perfect spot for a university student to witness history. But access was first-come, first-serve and I wasn’t going to be caught looking from outside the SkyDome. I woke up with the intent to be inside the ballpark and wound up standing fifth in line. Irrational mania consumed me, which made it easy to rationalize the decision that I could live with the consequences of skipping school and work for the experience. When the Blue Jays’ Juan Guzman threw the first pitch, I stood with a good view of the back of the outfield fence and the foul pole and little else. But I was there, shoulder to shoulder with friends as we revelled in the feverish euphoria that consumed Toronto and the nation. Twenty-three years later, I reside in Vancouver, 4,500 kilometres from the city where the Blue Jays are making legends of themselves during this 21st-century October. An October that for those of us who were riveted to the glory days of baseball in Canada remind us of the wild emotions of youth. The nights in 1992 and then again in 1993 when the Blue Jays won the World Series were among the most unforgettable of my life. We invaded the streets high-fiving, dancing, hugging, carousing deep into the night. The thought of it makes me itch to get on a plane to join the jubilation happening now on Front Street, along Blue Jays Way and in Dundas Square. However, my commitments these days can’t be as easily shirked as they were when I was 20, so I am engaged in manufacturing mania around me. On game days this postseason, I wear my uniform: blue T-shirt with an embroidered team logo beneath an unbuttoned Blue Jays jersey with no name on the back. Far from GQ; I’m all-in on showing allegiance. On the west coast, the days have been mostly sunny and warm, yet I’m spending the afternoons in dim-lit bars waiting for the next pitch. Baseball is a boring game, except when your team wins. Then it can be your best friend, a daily companion that captures your attention and swings your emotions from elation to dejection and back again. The scene in Toronto during the past few months is reminiscent of the early ’90s, when a seat to the SkyDome was coveted like a golden ducat. I wasn’t alone in my passion for the Jays then and I’ve been delighted to discover I’m not the only Vancouverite exuberantly doing the one thing Vancouverites are loathe to do: cheer for Toronto. AllStar Wings & Ribs (808 Bute Street) — With more than 80 big-screen televisions, including a whopping 190-inch screen, this spot in the west end of downtown is Vancouver’s leading bar for sports junkies. Its happy hour runs from 3-6 p.m., which is good timing for many of the Blue Jays’ games this October. Red Card (560 Smithe Street) — Home to 16 HDTVs and two 106-inch projector screens, Red Card is a top-notch sports bar with an okay beer list and better food choices than you would expect. The Blue Jays’ fans who show up here are a passionate and devoted bunch. The Charles Bar (136 West Cordova Street) — A sleek spot in Gastown, the Charles Bar features a nine-foot screen that shows games as well as several smaller TVs. It has good food and drink choices to help get you through the baseball games that last more than three hours each. Where Not to Go: Blue Jays fans should avoid the Library Square Public House (300 West Georgia Street). 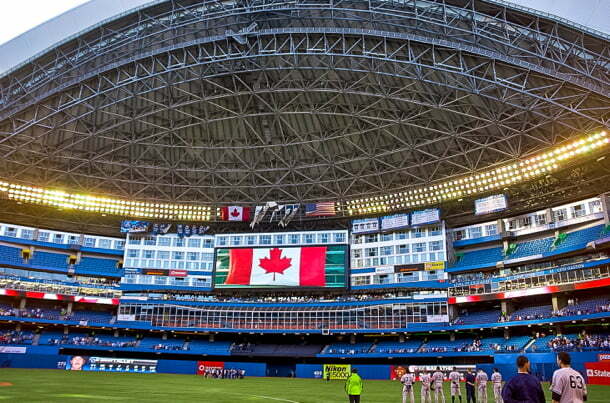 Although it has a massive screen, it was showing a World Cup of Rugby match on Saturday and a Monday night NFL game instead of the American League Championship Series games between the Blue Jays and Royals. Add in bad food and painfully slow service and it’s not the place you want to hang out. Getting There: You can drive and park at Rogers Centre but expect to pay event rates. In other words, expect to get gouged. If you would rather not be a sucker, do like the locals do — park away from the ‘Dome and take TTC right to Union Station and take the SkyWalk to the game. A great place to park is at the Green P at Front and University — but get there early and make sure you park on the second floor or you’ll be in a long line after the game. A cheaper option a few blocks away is Green P at Richmond and Victoria Street. Best option is to park on a subway line blocks away from the ‘Dome and ride in, or use the GO Train to get downtown.